Widely respected for his perspectives on faith in the modern world, Richard J. Mouw has long stood at the forefront of the “Christ and culture” debate. 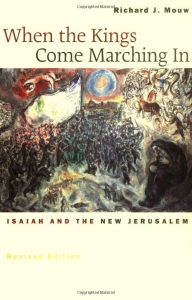 In When the Kings Come Marching In — here revised and updated — Mouw explores the religious transformation of culture as it is powerfully pictured in Isaiah 60. In Isaiah 60 the prophet envisions the future transformation of the city of Jerusalem, a portrayal of the Holy City that bears important similarities to John’s vision of the future in Revelation 21 and 22. Mouw examines these and other key passages of the Bible, showing how they provide a proper pattern for cultural involvement in the present. Mouw identifies and discusses four main features of the Holy City: (1) “the wealth of the nations” is gathered into the city; (2) the “kings of the earth” march into the city; (3) people from many nations are drawn to the city; and (4) light pervades the city. In drawing out the implications of these striking features, Mouw treats a number of relevant cultural issues, including Christian attitudes toward the processes and products of commerce, technology, and art; the nature of political authority; race relations; and the scope of the redemptive ministry of Jesus Christ. The volume culminates in an invaluable discussion of how Christians should live in the modern world. Mouw argues that believers must go beyond a narrow understanding of the individual “pilgrim’s progress” to a view of the Christian pilgrimage wherein believers work together toward solving the difficult political, social, and economic problems of our day.